Here at MetroKitchen we carry a few great knife brands. One of them being Shun. 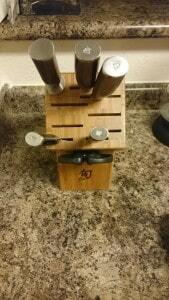 My boyfriend is big on his cooking knives and he had his heart set on Shun. We ended up buying the Shun Premier 7pc block set which has all the essential knives you would need to start out. These Shun Premier knives are an amazing quality, super sharp and beautiful to look at. At first, I was hesitant to use them because of how sharp they are and how clumsy I can be. Eventually, I did get brave enough to try the 8-inch chef’s knife. I have not looked back at using the old knives we have. They cut through whatever you need to slice or dice with ease. These knives have extremely sharp edges because thick innermost layer of the knife is made from VG-10 high carbon super steel. Also, the hand-hammered blade finish also helps with keeping food from sticking to the knife so much and it makes the knife look stylish. The block is very well made as well, It includes 5 extra slots to expand your Shun Premier Knife collection. 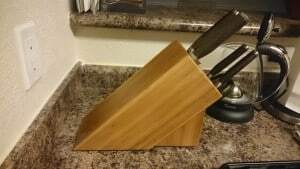 I did get my boyfriend a Shun 9 1/2″ Slicing knife for Christmas to help complete his knife collection and that knife cuts through meat like butter. There is a limited lifetime warranty with normal use and proper care. So I recommend hand washing and drying these knives ONLY. Do not EVER put them in the dishwasher to clean them, that will over time damage the blades which the warranty will not cover. You also get free lifetime sharpening from Shun. 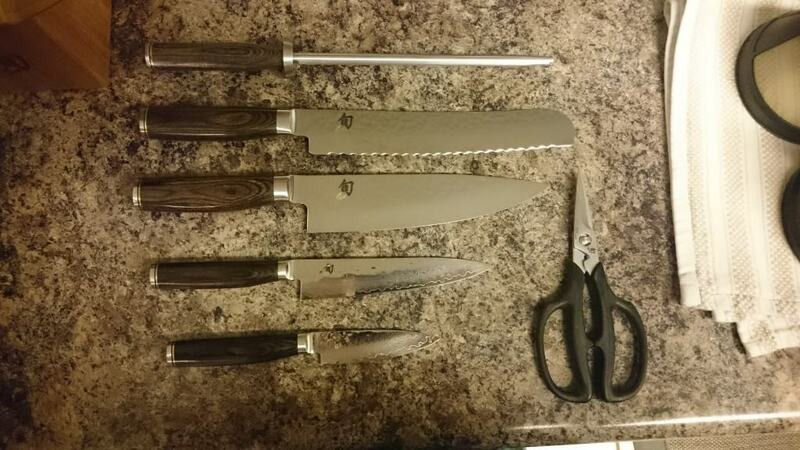 Pay only for shipping; $5 for the first knife, $2 for each additional knife. 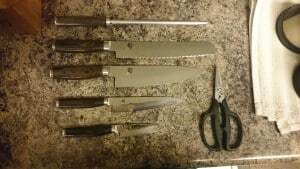 All the information for the free sharpening and what you would have to do to send them back to Shun. We have not had to sharpen them yet and we have had them for about 7 months and they are still as sharp as when we bought them!